This is a unique opportunity to travel the most spectacular section of the mighty Kaskawulsh and South Arm Glaciers. Pinnacle Peak and Mount Kennedy are in the foreground. From 10,000 feet, the spectacle seems to extend forever. A spectacular flight deep in the heart of Kluane. Many of Canada’s highest peaks are here, in the stupendous St.Elias Mountains. Amongst these giants, Mount Logan rises to 19,545 feet above sea level (5959 meters). It is surrounded by the world’s largest non-polar ice-fields. 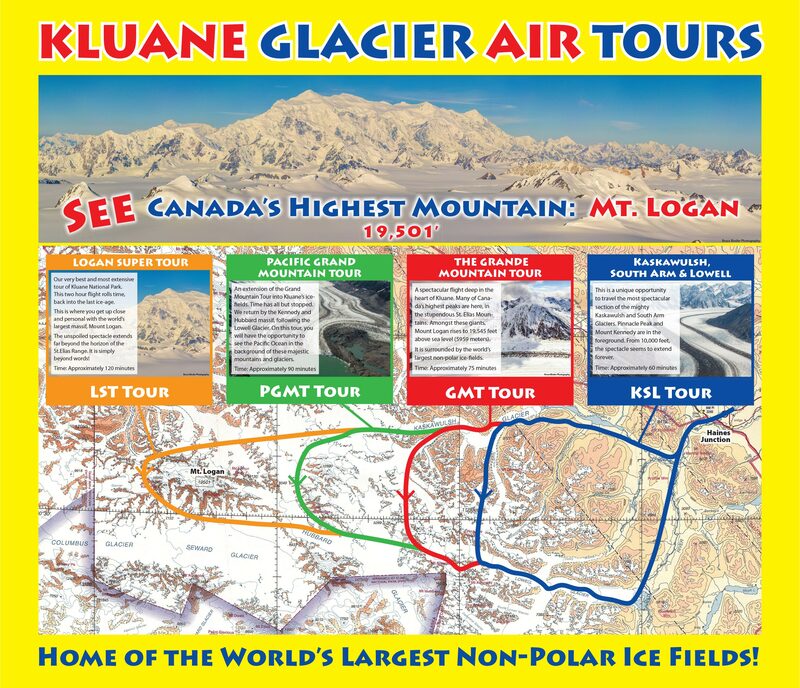 An extension of the Grand Mountain Tour into Kluane’s ice-fields. Time has all but stopped. We return by the Kennedy and Hubbard massif, following the Lowell Glacier. On this tour, you will have the opportunity to see the Pacific Ocean in the background of these majestic mountains and glaciers. Our very best and most extensive tour of Kluane National Park. This two hour flight rolls time, back into the last ice-age. This is where you get up close and personal with the world’s largest massif, Mount Logan. The unspoiled spectacle extends far beyond the horizon of the St.Elias Range. It is simply beyond words!